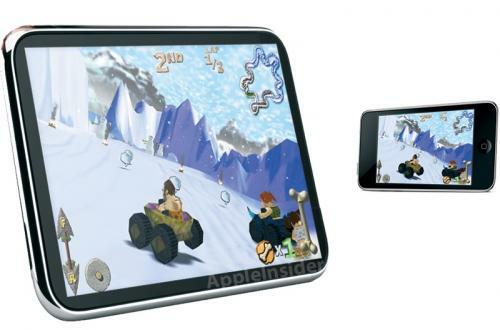 Apple Tablet to Launch in Early 2010 Using Chip Platform From P.A. Semi? AppleInsider reports that Apple is putting the finishing touches on its much-rumored tablet computer and is looking to launch the device, depicted in an artist's rendition, in early 2010. The report recaps a long history of developmental fits and starts as Apple has designed and redesigned the device in search of a solution meeting the company's high standards for product design and performance. The 10-inch, 3G-enabled tablet, akin to a jumbo iPod touch, is the latest brainchild of chief executive Steve Jobs. That distinction, as insiders will tell you, carries its share of baggage. Under the critical eye of Jobs, contours must be precise, each pixel of the interface has to match a particular vision, and there can be no fault -- no matter how slight -- or it's back to the drawing board. Sources now indicate, however, that Jobs is satisfied with current design of the device and the company is moving quickly toward a release in the first quarter of 2010. The report notes that considerable delays in the tablet's development have been due to decisions regarding the device's processing technology. While Apple had initially envisioned the tablet to run using Intel's Atom platform, sources hint that dissatisfaction over battery life led Apple to reconsider its decision and ultimately purchase chipmaker P.A. Semi in order to move forward with its own ARM-based chip designs. P.A. Semi's role in delivering chips for the forthcoming tablet was rumored earlier this month based on VentureBeat sources who claimed that P.A. Semi's team had been divided into two parts, one for iPhone/iPod and one for a tablet, upon Apple's acquisition of the company in early 2008.